Q: Miss Phoebe, when did you adopt your forever family and where did you meet them? 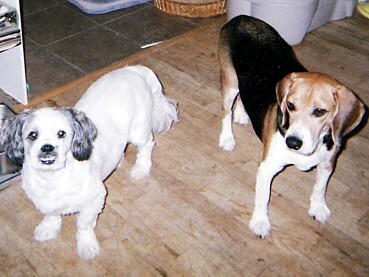 A: Their gotcha day is March 8, 2007. I was at "Molly's Place" in Mechanicsburg, PA.
Q: What is your arrival story? "We sat down to look at the pickin's, and a Beagle decided to sit on my husband's lap and would not get down. Eventually she moved to my lap. She was so sweet and possessive. We eventually started looking at the German Shepherds, but every time we sat down, this Beagle made her presence known. We eventually took our "candidates" into a private room to see how we interacted, with one of our finalists being this pushy Beagle. Her eyes made you melt and she wanted us. 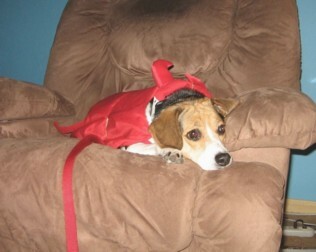 Then, when we finally made the decision that we would become Beagle converts, we couldn't find her! (Apparently, for the three weeks she had been at the shelter, she would hide under a steel cabinet where she couldn't be seen.) The staff couldn't figure out why she wasn't adopted sooner, but it seems like she was doing some interviewing of her own (!) and decided we were the right humans and worthy of her appearance from her safe haven. We bundled her up and brought her home... where Phoebe now majestically rules. (Ironically, there is a circle of life story here that I never realized until about six months later. The day we had to put down Bruno was the day Phoebe was abandoned at the shelter, and the day we brought her home, was the anniversary of the passing of another of the family's German Shepherds, Brandy.)" "I had 2 dogs, but they seemed bored, so I went to the shelter to find another small dog. 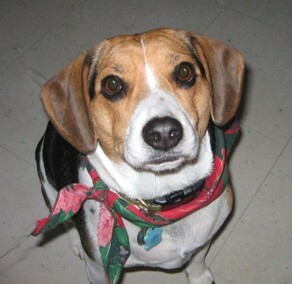 I had never thought of a Beagle, but when I went into the small dog room, I looked down and there was the saddest looking little Beagle...who actually spoke to me! I know that in dog language he was saying, "Please take me home!" The moment our eyes met, I melted. I think he was a Katrina dog. He came to the shelter with canine pneumonia and was returned 3 times for bad behavior (I didn't know that until after I adopted him!) That was about 2 years ago. My vet named him Snoopy. He doesn't like cats, and my vet has a poster on the wall with cats. So, he howls at the cats when we visit the vet. He loves my vet because he gets a special treat from him. He knows exactly where they are kept and stands at the vet's counter and howls, pointing to the cabinet until the treat appears. He has health problems, and he's the naughtiest dog in the world, but I love him so much. He has chewed up most of my books, eaten my mail continuously and toilet papered the house and yard 5 times. I had to have the trash can chained to the wall, the mailbox installed outside the house, and the toilet paper dispenser nailed to the inside of the closet. He is the sweetest dog and still talks to me. If I cry, he hugs me and has an asthma attack, so I try never to cry in his presence. He howls for his food and is a terrible chow hound, hungry all the time. He sleeps on my bed and always lays on my side of the bed where he won't budge until I bribe him off with a treat. Then he retreats to the foot of the bed. During the night, he sneaks back and cuddles right next to me. It was love at first sight, so Snoopy is here to stay! Oops, I have to go now, he's eating my morning newspaper..."
"Lucy is our 7 or 8 year old female Beagle who has owned us for 2.5 years. Lucy is our second Beagle. She lives with 2 humans, a terrier mix, a Corgi mix, and an ornery cat. We found Lucy online. She was listed on the Adoptable Pets page of a local shelter. She'd arrived at the shelter after animal control picked her up. She'd been found wandering the street and roads near farm country in Eastern Washington. Today, 2 years later, we think we know why she was wandering. The first thing we noticed about Lucy was how quiet and easy going she appeared (see photo). Even the vet who examined her commented on her unusually peaceful nature. This is still true; however, Lucy does have one notorious Beagle characteristic that has only presented itself in recent months - she is a master escape artist. 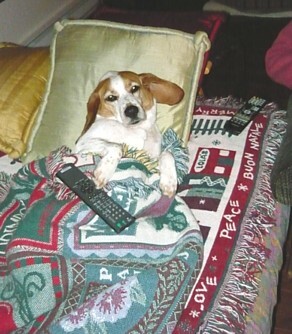 If you haven't watched the videos of amazing beagle escapes, do so and know that the images are real! We don't know when or why but when Lucy wants to go, she goes. We've spent hours and hours and many dollars repairing and reinforcing our fence line. She continues to defy gravity, steel, stones, and everything we put in her way. One neighbor watched her climb up and over a 5 foot chain link fence. Another saw her leap onto a 5" x 5", 3 foot tall electrical box, balance on the box, then leap more than 2 feet up and over the next fence line and into their yard. The day before she'd pushed 30 pound stones out of her way, chewed threw 2 layers of chicken wire that had been layed and buried along the fence line, then dug under the buried portion of the same fence. And what does she do when she arrives? She sniffs and wanders. Or so we've been told! Lucy receives daily walks with our other dogs at the beach, in the park, and around the neighborhood. She has a doggy door and can come and go as she pleases onto her bed or out into the 1/4 acre yard where she can romp and roll or lay in the sun. But the nose knows something, and when it does Lucy goes! Solutions? 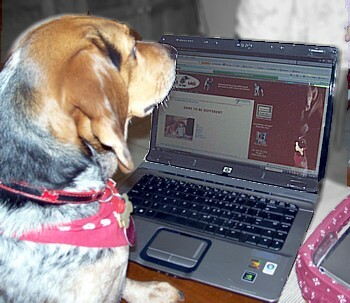 We're considering doggy day care for the few times each week we must be gone." We are Beagle owners quite by accident! In 1991, when our youngest child was about to enter kindergarten, he was devastated because his pre-school "girlfriend" would soon be leaving for another district. We told him we could adopt a puppy, and he asked for an "eagle". After a few days we realized what he really wanted was... a BEAGLE! 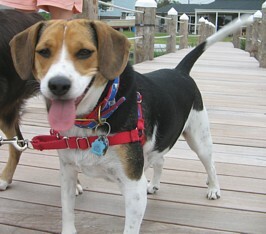 We went to the Monmouth County SPCA, where there was a 4-month-old Beagle, with many people interested in adopting her. We visited her every day for a week, until the shelter staff realized we were serious about adopting this dog. Our son named her Chelsea, the name of his pre-school sweetheart. The dog was a constant companion, eating the kids' toys, crayons, food, and whatever else she could steal. But they loved her dearly. When Chelsea developed a rather large tumor near her sp leen, we cashed in a retirement account for her surgery. Our daughter actually curled up with her in the crate at the vet's post-operatively. We cherished this dog, who lived for several years beyond that surgery. Two weeks after our son, our youngest, left for college in 2004, she died in my lap. 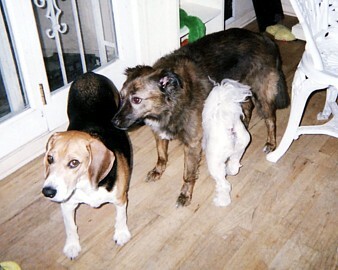 The kids came home from college to mourn the passing of their 13-year-old companion. We were heartbroken and devestated to find ourselves left with an "empty nest". So nine months later, we were ready for another Beagle. We adopted an 18-month-old Beagle who was "too much" for a young mother to handle in addition to her own young children. The dog ate their toys, their crayons, their food and whatever else she could steal (sound familiar??). Well, we had experience with that, for sure! Again, our kids came home from college so the rescue group people could see if this dog was a fit for our family. She bonded with us immediately at the local PetSmart, which was the neutral territory the rescue group, Animal Alliance, had chosen. We were determined to be a good match, and she was named "Maggie" by our daughter. The first few months were terrible with this little out-of-control Beagle! We thought, "No wonder she was given up!... my husband wanted to return her. But we remembered that PetSmart had been offering training classes. So we signed up, took the beginner's and intermediate classes, and we had a well-behaved companion in no time. Our children are all out on their own now, yet we don't have an empty nest. We share our home and our hearts with Maggie. And we thank God that our 5 year old, so long ago, asked for an "eagle".